Angus, Leslie, and I sucked it up yesterday in the crappy weather to look for birds in a spot we hadn’t explored before. It was lousy with chukar, and so was I. I shot two-thirds of a box and brought home two birds. Still, despite both Leslie and I being a bit under-the-weather and hiking around some pretty steep country in underwhelming weather, it was a great day. If you watch the video (see below), you’ll notice no shortage of action. (Please realize in the scenes where I’m running back and forth like a brainless buffoon my safety is indeed on.) I think because of the stiff wind, Angus seemed to have more trouble than usual pinpointing birds, and some of the birds seemed warier than usual, often busting on their own well outside of range. A couple of my recent posts discuss my confusion over chukar tactics, and today did nothing to clarify anything for me. 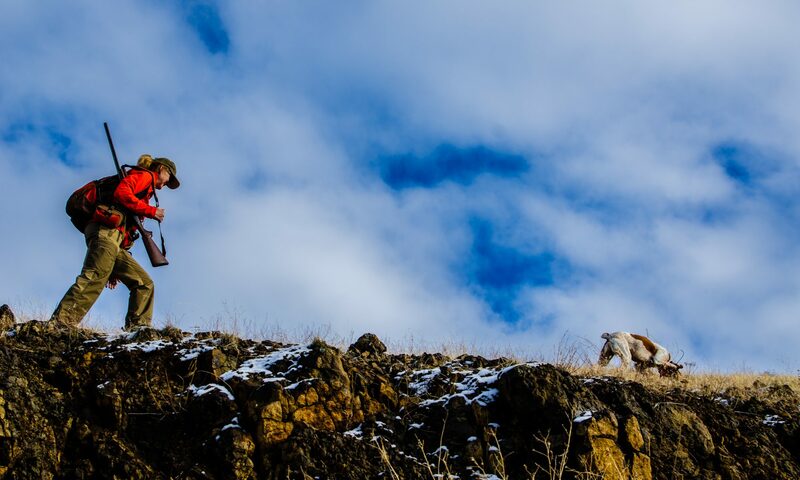 I’m tempted to give up trying to figure out how high or low they might be in whatever conditions on whatever terrain and just do my best to think like a chukar. This worked a little today, when I speculated that in the heavy wind the birds might prefer to be on the leeward side of ridges. That’s where we found most of them. But there were notable exceptions to this, and in more than one case I called Angus away from windy areas that actually (we found out later) harbored birds. Anyway, it was nice to get that much action and see so many birds, including the interesting and beautiful Hungarian partridge. Angus made two spectacular retrieves, including one on a Hun I knocked down – I thought – cold. Angus couldn’t find it where I saw it fall, and I was sure it wouldn’t have run anywhere. But my Brittany boy wonder was hot on the trail of something, and I followed him, thinking he was tracking the covey members that busted a moment earlier. A couple hundred yards later he pointed hard, and a one-winged bird jumped and ran, with Angus in tow. Weaving in and out of sagebrush, the intrepid but ill-fated Hun eluded Angus for some time before the mutt finally won. So there you have it: a triply lousy day. Lousy with birds, lousy shooting, and lousy weather. I wouldn’t trade it for much. Good vidio.wish i was running around chasing dam birds. Are season is closed already.